When choosing what to feed our horses to ensure optimum health and growth we must consider their nutrient requirements. Here we look at the basic types of nutrients for horses and their functions in the equine diet. It is essential to feed a correct balance of nutrients - too much of one type nutrient can cause as much harm as too little by causing an imbalance in the horse's diet. The definition of a nutrient is: “a nourishing substance including minerals, vitamins, fats and oils, protein, carbohydrates and water”. Of the many mineral elements that exist, essential dietary minerals are those that are essential for normal body function in a horse or pony. They are classed as major or micro (trace) depending on the daily quantity required. Minerals have a variety of roles including structural (eg calcium in bones) and electrochemical (eg sodium and potassium in water balance). Vitamins are nutrients that play essential roles in everyday equine body processes, and most have several specific functions. Many vitamins cannot be manufactured by the horse or pony's body (exceptions in the horse are vitamins B, K and C) and so must be present in the diet. 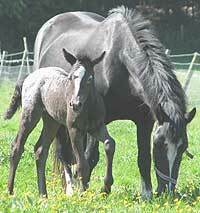 Many are required in tiny amounts but deficiencies of vitamins in a horse's diet will eventually lead to disease. These are “lipids”, substances that are insoluble in water and made up of fatty acids. They act as carriers within the body (some vitamins cannot be absorbed without fat), are important components of cell membranes and are sources and stores of energy. Fats and oils are the most concentrated source of calories for a horse. Essential fatty acids cannot be manufactured by the body so must be present in the diet for good health. Proteins are complex organic compounds that form the building blocks of the body and act as important enzymes and hormones. Proteins are made up of amino-acids in the same way as words are made up of letters. Some amino acids are essential as they cannot be synthesised by the body as the others can, hence they must be present in the diet. The proportion of essential amino acids in a dietary protein reflects the quality of that protein. Carbohydrates are organic compounds that are important sources of energy for the body. The main sources are sugar and starch, but herbivores - including horses - are able to break down and utilise fibre (a structural carbohydrate) due to the microbial population present in their gut. Adequate fibre in a horse’s diet is crucial for good health, and too much dietary starch disrupts the hindgut and may result in all sorts of problems such as colic and Laminitis. Although not normally considered a nutrient, water is crucial for life.